It appears this solution is already well under way by several capable companies. You can read about eight companies in Jonah Comstock’s article over at MobiHealthNews. The last two, by e-Pill and Phillips are not particularly impressive or appealing to me, being based on older technology, but the rest appear quite interesting. Vitality GlowCaps – Being sold out of CVS for $60. First a light, then music, and finally a phone call notify the individual to take their medication. This is a reasonably priced product, though eventually I’d like to see every pill bottle come with this technology built-in and prices drop for separately purchased bottles come down to $5-$10/ea. This apparently requires a base station and also a monthly AT&T service charge. MedMinder – This product is impressive and available. It appears that you do not purchase the device outright but “rent” it. The cost is between $40-$60/mo., which IMHO is a bit expensive, I’d like to see maybe $10/mo., but hey, for those who are taking a lot of pills and especially for the elderly with memory problems, this is probably a worthwhile investment. MedSignal’s Pill Case/Gateway – Currently pending FDA approval, only available for research purposes. If I was the Obama administration, this is one area I’d be looking to foster growth with the expectation that it can significantly reduce healthcare costs. According to Abiogenix’s site non-adherence costs over $300 billion in wasted spending in the United States each year. How about cutting that down by 80-90%? I struggle with overpowering daytime sleepiness. This may be compounded by the fact I take Adderall XR for Attention Deficit Disorder (ADD). I recently went to my psychiatrist and discussed this issue with him and he gave me a supplemental Adderall prescription. This is not an uncommon method of dealing with this increased sleepiness once the medication wears off. I take the supplemental pill later in the day when the first one runs out. In addition to all this, I also take Prozac (fluoxetine) – 60 mg (three 20 mg tablets). I filled my prescriptions and went home. The next morning I went into my usual auto-pilot mode – taking medications and vitamins, brushing teeth, showering, deodorant and so on. It wasn’t until I had taken my medications that I realized I had accidentally taken three 20 mg Adderall tablets instead of three 20 mg Prozac tablets. Thankfully, this was not a critical overdose for me…but had it been another medication, it could have been. But my personal mixup one morning is fairly simple compared to those faced by many others. I’ve worked a bit with the elderly, including those who are suffering from various forms of progressive brain degradation. These individuals find themselves in a dangerous place when they cannot remember during the day whether they have already taken their medications for the day or not. Many of them don’t want to move into assisted living homes just yet, and apart from this sort of minute detail are still capable of living independently…but an inability to remember when medications were last taken can quickly remove this independence. Then there is the issue of regularity, especially for those with mental illness or who suffer side effects from taking a medication. It is always tempting to skip one day – a few – a week or two, a month. The efficacy of most medications is greatly reduced when taken in this haphazard way and for individuals with mental illness oftentimes results in a significant relapse. And these are just a few of the challenges facing those who take medication and/or supplements on a regular basis. Sure, they are surmountable by willpower and self-discipline…but when technology can make our lives easier I prefer to spend my willpower and self-discipline on more substantive areas. We’ll talk more about the complexity and cost of this solution later, but I want to note at this point that I believe this could be an extremely affordable solution. In early stages I wouldn’t want to see its cost exceed that of the Raspberry Pi computer at $35…and with wide utilization I would see this being a commodity product that would replace traditional pill containers at no-cost to the consumer. The automatic pill dispenser is expandable. The above figure represents a dispenser with six individual dispenser units. If one had only one medication, one would need only one dispenser. Each additional dispenser can simply be connected (think legos) to the next. Dispensers could vary in size – but the goal is that they be as small as possible, allowing for a good number of them to be connected together without consuming significant space. Each dispenser would have a small display which would show the number of pills remaining in that dispenser. Below that another small display showing the quantity an individual programmed the dispenser to give each day. The Give button would dispense the above desired number of pills – if they had not already been dispensed for the day. Holding down the Give button for ten seconds would force it to release an additional pill (e.g. if for some reason the system malfunctioned and dropped only one pill when it should drop two, this would allow one to “force” the system to drop another). 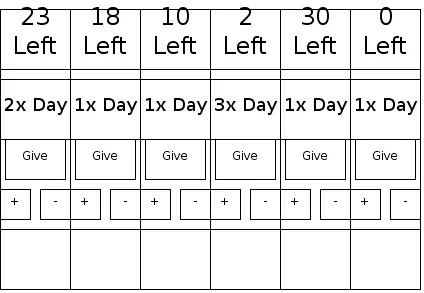 The + and – keys would be used to change both the number of pills in the unit and the quantity to be given each day. You’d hold down the plus key until one of the displays above began blinking. Whichever display was blinking indicates the display you would be changing for the value of. Ideally, eventually pill boxes would no longer be distributed – each pill box would be one of these dispensers. It would come pre-programmed with the correct number of pills and dosage. Until such a time it doesn’t make sense to have the pill dispensers be disposed after each use – so they would be refillable. One would dump the new medications when received into the dispenser and reset the dosage and number of pills. This in and of itself would be extremely helpful…but I’d like to take it a little further. Did anyone wonder why the units lock together? Besides making it orderly there is another reason. Each unit would have its own “intelligence” (that powers the display, etc. ), but one would also have a lock-on extra unit that would contain a central brain. Really this brain would be very weak (and inexpensive). It would consist of a WiFi chip that would relay information from the pill dispensers to a central hosted server transparently. Individuals could open up their web browser, type in the website (say davesamazingpilldispenser.com) and login using a username and password they select. Once inside they would be able to (a) set values from a web console rather than on each dispenser (this would be much quicker for those who have lots of pills), (b) determine accountability partners who would receive email alerts when the dispensers were not decrementing at the expected rate (e.g. someone stops taking their pills for x number of days perhaps the doctor, spouse, or family friend is notified via email or text message), (c) view (and share if desired) charts indicating their history of medication use (this would help, for example, when a medication needs to be taken 3x a day…the dispenser would mark each time the pill was taken and this could be analyzed by the individual or a doctor for issues). Now, all of this can be done fairly simply and initially. Further on one might add the ability for the pill dispenser to automatically order refills of medications/vitamins via integration with online pharmacies / amazon for vitamins. The dispenser boxes are using fairly simple circuits and mechanisms. I don’t see any reason why these could not be manufactured very cheaply. I’ll work on putting together some figures – but my goal would be that each dispenser would not cost more than $5 and the WiFi component $5-$10. Thus, if one takes six medications and wants WiFi one might make an investment of $35-$40. Factor this out over a year and it is an expense I think worthwhile…and there is no reason the dispensers could not last for multiple years – especially if the web console is used instead of the buttons (which, over time, may wear out). There are a few things the initial pill dispenser wouldn’t do – though I think these features could be added over time. The biggest of these is that it won’t keep people from abusing it. That is – someone will be able to break open the pill dispenser, tell it to give more than they should be taking, or have the dispenser release pills and then throw them away. I believe the vast majority of issues with medication adherence are related more to accidents and forgetfulness than to deceit or other maliciousness. Creating safety mechanisms in the initial device would raise the cost significantly – and unnecessarily – for the vast majority of users. Doesn’t Somebody Already Do This? There are a few companies I found who build automatic pill dispensers. These include MedReady and ePill. However, I was disappointed in these units as they all lacked various features…and most significantly, they are quite expensive (anywhere from $100-$900). I think this industry is ready for disruption. Manufacturing: We’d need to manufacturer the automatic pill dispenser. This would mainly be a simple pill box but with the addition of a mechanism to release pills. Circuitry: We’d need to develop the circuitry to operate the machinery, interlock with other dispensers, and allow changes to the values stored by the dispenser. WiFi: We’d need to create the wifi unit. Web Console: Data would need to be parsed and displayed via a secure web portal. We can discuss how any revenues – should they arise – would be distributed…but at this juncture I am largely interested in creating a prototype. I’m willing to donate time and effort to the cause and are looking for others interested in doing so…but there isn’t any money here to start with, so no need to contact if you want to be paid up-front for your work…maybe someday there is a hope you might be…but, its just that a hope – for you and me. If it comes down to it I’d rather see it implemented with no profit margin than derive profits with only limited distribution. Diagram.ly deserves a big thanks for their sweet and free online diagramming software I used to create my artistically challenged 2D diagram above. This is exactly what I was thinking of developing until I read your blog. I am currently looking to design a pill delivery system that also incorporates some lockout for pain meds , as well as some basic vital signs prior to the pain meds (PRN meds) for my mother to use. Right now, I’m stuck on the pill delivery system. I highly doubt you can do what you want for $35.00 each – since you will need a Raspberry Pi or Adruino just to do the controlling. Not to mention, the most expensive part will be the liablility insurance you would need to buy if you intended on selling it. I do like the idea of daisy chaining however. My best guess would be it would cost around $60 each at a minimum. I just wanted to let you know that the uBox is now available for sale! As you hinted in your post, development is an intricate process… But I would love to hear your thoughts on our approach if you decide to give it a try. Thank you. This looks very impressive! I think the subscription model is a great way to go (though some may like to have the option to buy straight out) and I like the free hardware upgrades! Next story Outcasts (TV Show).